One of the common pests Arizonans deal with is scorpions. Some people say you will always have scorpions in San Tan Valley, Arizona if you see one. However, with the right scorpion control in San Tan Valley, homeowners will be able to rid scorpions from their property. A scorpion bite is incredibly painful and can lead to severe allergic reactions. If you have any children, you need to be careful about scorpions as the hot weather brings them out in large groups. Scorpions can be challenging to identify as they are normally a yellow or brown color. This makes it easy for them to blend in with the flooring, walls, and carpeting of the home(even outside in the dirt). Keeping the scorpions out of the home is vital to prevent serious stings. An invasion of scorpions in the home will have to require the help of a scorpion exterminator in San Tan Valley. Keeping the scorpions from getting inside your home is very vital. A great way to prevent them from getting inside the home is by replacing the weather stripping around the doors and windows of the home. San Tan Valley scorpion control companies can provide assistance with many prevention tips to keep scorpions away and out of your home. If you can see entry ways into the home, plug those holes. Small holes not only make it easy for scorpions to get inside the home, but other pests can use these entry areas as well. Offsite vents are one area to consider as they are easy for pests to push through. Sealant works well to plug up small cracks around the foundation or around areas of the home where you have entry areas. Check around the wires and pipes of your home as they are small areas that are easy for scorpions to crawl through. Another way to help reduce problems with scorpions getting inside your home is by moving the potted plants you might have, from being around your home. The water attracts the scorpions to the home. Debris in the yard makes for ideal areas for scorpions to create homes with and you can end up with other pests as well such as black widows and termites. It is important to contact Varsity Termite and Pest Control to remove the scorpions from your home and yard. Many residents in San Tan Valley often believe that scorpions are something you cannot kill. You can control them with the right removal methods. Outside perimeter treatments normally include thin dust glazes that keep the scorpions from wanting to come into your yard. 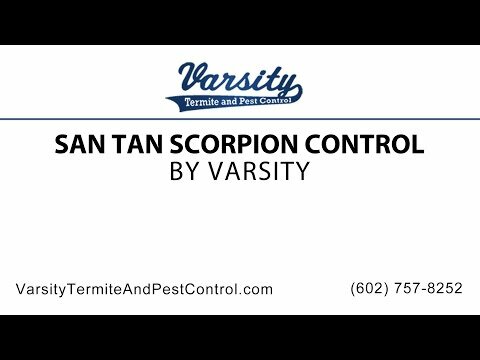 For more information or any question and concerns concerning you about San Tan Valley scorpion control, contact Varsity Termite and Pest Control today! You may also check out our website and other blogs to find more information on scorpions as well.